JOHN WIGGINS was born in Bartlesville, Oklahoma, and attended Oklahoma State University where he graduated with a Bachelor of Arts, with honors in 1971. He then attended the University of Oklahoma College of Law where he received multiple American Jurisprudence awards. He has been awarded membership in the honor societies of Phi Kappa Phi, Pi Sigma Alpha, and Phi Delta Phi. He received his Juris Doctor, with honors in 1974, and was admitted to the Oklahoma bar that same year. Mr. Wiggins has tried numerous cases, including complex litigation, class actions, and bad faith actions for the plaintiff and defense. 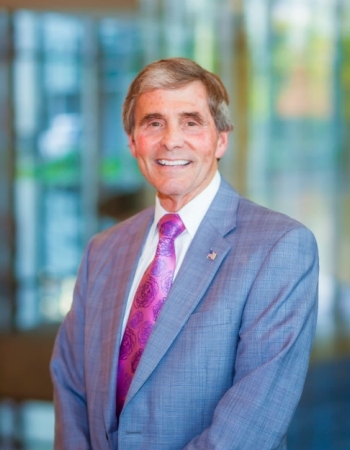 He is triple board certified by the National Board of Trial Advocacy (Civil) and the American Board of Professional Liability Attorneys (medical malpractice defense), and the American College of Board Certified Attorneys. He is admitted to practice before every state and federal court in Oklahoma, the United States Tenth Circuit Court of Appeals, the United States Tax Court, and the United States Supreme Court. Mr. Wiggins is a member of the Oklahoma Bar Association and a Fellow in the Oklahoma Bar Foundation. For many years, he has been a Fellow in the American College of Trial Lawyers and has served on its Legal Ethics Committee. He has also long been a member of the American Bar Association, Oklahoma Association of Defense Counsel, International Association of Insurance Counsel, Association of Trial Lawyers of America, and the International Academy of Trial Lawyers. In addition to those memberships, Mr. Wiggins has received appointments as Senior Counsel for the American College of Barristers, Trial Advisor for the Oklahoma State Board of Medical Licensure and Supervision, Advocate for the American Board of Trial Advocates, Member of the Governor's Select Committee on Tort Reform and Member of the Health Care Indemnity Fund Task Force. Among his achievements, Mr. Wiggins was recognized in 2009 as Best Lawyers "Lawyer of the Year," and Best Lawyers "Oklahoma City Personal Injury Litigator of the Year." In 2001, he was awarded "Attorney of the Year" by the Oklahoma Court Reporters Association. In 2015, Mr. Wiggins received the Excellence in Service Award from OU Physicians. In 2016, he received membership in America's Top 100 Attorneys and was given a Lifetime Achievement Award. Mr. Wiggins has been listed as one of "The Best Lawyers in America" each year from 1993, selected by his peers to the Oklahoma Super Lawyers list each year from 2006, and ranked as one of the "Top Fifty Lawyers in Oklahoma" on multiple occasions. In 2017, he was inducted into the Marquis Who's Who. Mr. Wiggins has authored various publications on topics including trial tactics, medical malpractice, personal injury law, and insurance defense. Additionally, he is a frequent speaker to legal and medical groups on topics related to trial practice and healthcare law. Mr. Wiggins resides in Edmond with his wife, Susan.